2) Use the masking tape to cover the areas you don't want to spray paint. I chose simple striped designs but there are lots of other things you could try- try adding small snippets of masking tape to your tiles, blocking out a grid, mask just the corners or the sides- so many possibilities! 4) When the paint is completely dry, carefully peel away the masking tape to reveal the finished design. I didn't leave mine to dry completely and as you can see, this has resulted in jagged paint lines. I quite like the effect, but if you'd like straight lines, do leave the paint to dry completely! Tah da! Make a nice cup of tea, grab your favourite biscuits and put your new coasters to good use, or use as a pot holder for your plants. Happy making! Happy Sunday to you all! Today I'll be working on an upcoming How To that I'll share with you soon, plus spending some time with Mr Writer and family. I've also started planning to make my first quilt... oops. I have projects to finish but I can't help but think about the next one! 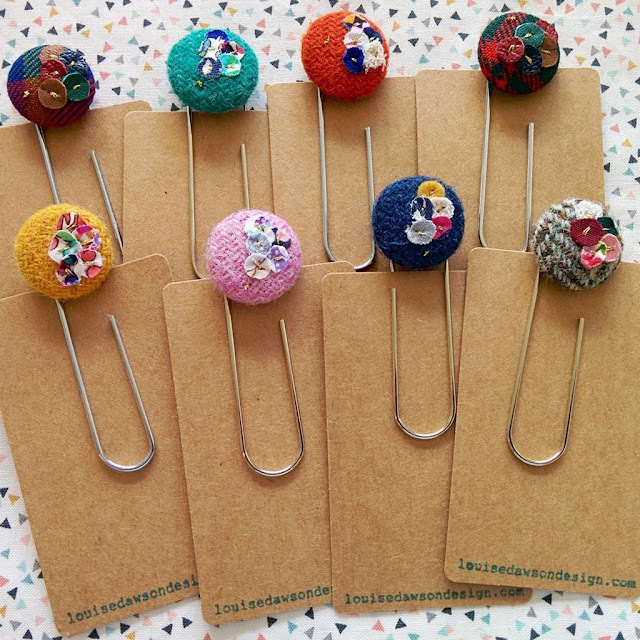 I just wanted to stop by today to tell you that I have a couple of colours of my Harris Tweed button bookmarks/giant paper clips available in my Etsy Shop, but I make them in many more colours. I also make Tartan and knitted ones too. They are all embellished with upcycled fabric pieces and the Tartan ones are embellished with upcycled leather pieces. 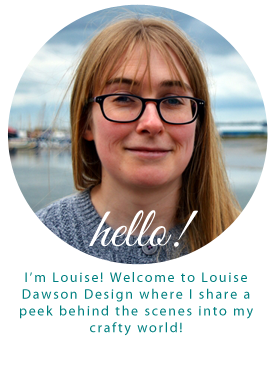 As always, if you would like something in a certain style or colour that you can't see in my Etsy Shop, or if you have any other specific requirements, drop me a message here, or email me at enquiries@louisedawsondesign.com and I'd be very happy to help! Walking by the river while Mr Writer catches Pokemon is the perfect excuse for an ice cream! I've no idea what this flower is but it's certainly very pretty! I read Gone Girl in July- give it a read if you get the chance! Necklace ready to go off to its new home. I love packaging orders! Nelson cat has enjoyed taking it easy this month! He's developed a habit of taking over your book and sleeping on it if you're reading! Who knew books could be so comfy?! So that was July and here we are in August already! What did you get up to last month?